Artist impression of IRDT as it enters Earth's atmosphere with heat shield deployed. The European Space Agency's (ESA) Demonstrator-2R spacecraft is still missing after disappearing last week during re-entry into the Earth's atmosphere. The Demonstrator, the latest model of the agency's Inflatable Re-Entry and Descent Technology (IRDT), is a system that uses an inflatable cone-shaped heat shield and parachute to return cargo from orbit. The Demonstrator was launched into space aboard a Russian Volna rocket from a submarine in the Barents Sea on October 7 at 10:30am. Expected to land in Russia's eastern Kamchatka peninsula half an hour later, the craft never made it. Claus Reimers, the IRDT project manager, said that initial telemetry data revealed that the Demonstrator's trajectory may have been more shallow thus extending its flight. If true, then the device may have overshot Kamchatka and landed in the Pacific Ocean, Reimers told SPACE.com. The Demonstrator was the first IRDT test in over five years. The last test was in February, 2000, when two IRDT devices managed to re-enter the Earth's atmosphere but were damaged in the process. The Demonstrator was built by the Russian space design company Lovochkin under contract with ESA. The Demonstrator's IRDT system was supposed to be a cheaper and lighter alternative to the bulky and expensive heat shields and brittle ceramic tiles that are traditionally used to protect spacecrafts during atmospheric re-entry. An IRDT device consists of a blunt-nosed capsule coated with an ablative material that disintegrates when heated. This carries away excess heat while at the same time slowing the device down. 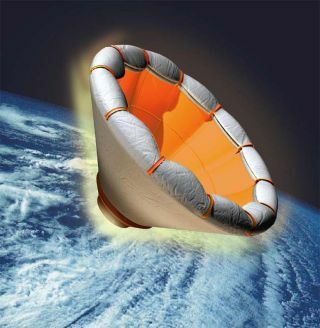 The IRDT's inflatable heat shield is made from multiple layers of a silica-based fabric saturated with an ablative material and can be quickly filled with nitrogen gas during the early stages of re-entry. Once safely inside the atmosphere, the IRDT's parachute inflates, slowing the device down further and bringing it in for a soft landing. When both the heat shield and parachute are inflated, the IRDT resembles a much larger version of the shuttlecocks or "birdies" used in badminton and it works in a similar way as well. The conical shape of both the IRDT and the shuttlecock create drag as they fly through the air, and this helps both objects remain stable. IRDT is not a new idea; similar concepts have been around since the earliest days of spaceflight. "In the 1960s, ideas were developed for similar concepts for the purpose of astronaut rescue," said Eike Kircher, head of Basic Technology Research at ESA. One example was General Electric's Man Out Of Space Easiest emergency bailout system, otherwise known as "MOOSE." The idea was that an astronaut would leave his ailing spacecraft in a space suit and cannonball back to Earth inside a giant bag that could be filled with foam. Fortunately, the idea didn't catch on with either NASA or the Air Force and MOOSE was abandoned by the late-1960s. An early precursor to IRDT was carried aboard the Russian spacecraft Mars'96. It was intended to ferry two modules to that planet's surface, but the mission was lost due to a launcher failure. The IRDT's primary task will be to return payloads from low Earth Orbit but it's designers also envision it being used as an atmospheric research tool or as a descent capsule for science missions on other planets. Current designs allow the IRDT capsule to carry payloads ranging between 220-240 pounds, but Kircher said it's possible that future models could be scaled up to accommodate larger payloads. For now, IRDT will only be used to transport non-human cargo but the ESA is developing a similar technology for use an emergency escape system from skyscrapers.